July 5, 2017 10 comments on "Canning Dandelion Jelly"
I’ve always wanted to try making dandelion jelly. It sounds a little weird, but everyone says it tastes like honey. Well guess what? It does! (Dandelions also have many health benenfits). 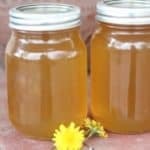 Dandelion jelly is now one of my favorite top 10 easy homemade jelly recipes for beginning canners. 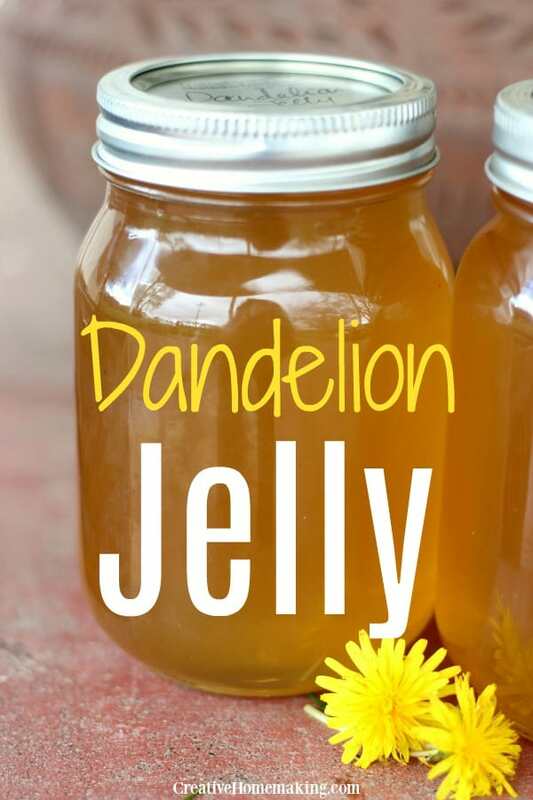 Dandelion jelly is really easy to make. You just need to harvest some fresh dandelions on a sunny day. Make sure that the dandelions are in an area where they have not been treated with any pesticides or sprays. You will need about 2 cups of dandelion flowers to complete this recipe. This recipe will make about 3 pints or 6 half pints of jelly. New to boiling water canning? Watch the video below and watch me prepare this recipe step by step. Note: Jelly can take several hours or even several days to completely set, so it’s important not to disturb the jars after you remove them from the canner. Moving them can cause the jelly not to set properly. If after a couple days the jelly is still not set, then follow these directions. If you like this recipe you should try canning lilac jelly too. The smell and taste are wonderful, and help you to enjoy your lilacs all year long. Easy recipe for canning dandelion jelly. Rinse dandelions in a colander and remove stems by snipping them off with a pair of kitchen scissors. Place dandelions in a bowl and cover them with 4 cups of boiling water. You are essentially going to make "dandelion tea." After the water cools off, place the bowl of water and dandelions in the refrigerator until the next day. It was two days until I got back to mine, but it was just fine. The next day, run the mixture through a fine mesh strainer to remove the pieces of dandelion. You should end up with a clear liquid. If not, try pouring it through the strainer again. Measure the tea, adding a little water if necessary to get exactly 4 cups of liquid. Pour liquid into a large stock pot. Stir in lemon juice. Sprinkle the pectin on top of the juice and use a whisk to mix it together. Stirring constantly, heat until boiling. Boil for one minute. Add the pinch of butter and return to a boil. Add the sugar to the pot all at one time (measure it and have it ready ahead of time). Stir until sugar is dissolved. Return to a boil and boil for one minute. Remove the pan from the heat. Remove any foam with a metal spoon. Ladle the jelly into hot sterilized jars, leaving ¼ inch head space, and process in a boiling water canner for 5 minutes. Remove jars from canner and place on a towel on the kitchen counter to cool. Lids will make a pinging noise when they seal. If a jar does not seal, place it in the refrigerator and eat in the next couple of weeks. Cooled sealed jars can be stored in the pantry for several years. 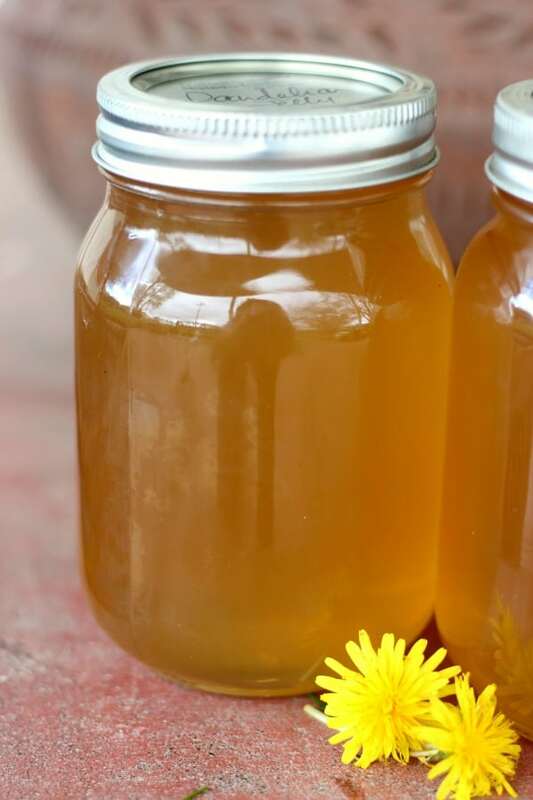 10 Comments on "Canning Dandelion Jelly"
Should this be clear as in not yellow at all? I’ve already picked my petals off. Do you have any idea the measurement for just the petals? Hi! I’m not exactly sure, but I’m guessing you could use half the measurement called for in the recipe. The measurement doesn’t have to be exact…you are going to remove the petals anyway. They just add the flavor. You probably should err on the side of putting in too much rather than too little to get the most flavor. Can you do this without the butter? 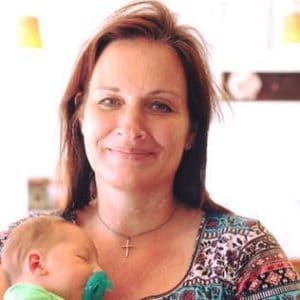 I have children with dairy allergies but I would love to make this jelly…. Yes! You can totally leave out the butter. It is just to help reduce foaming. You can just remove the foam with a spoon before canning. This is an awesome recipe, can’t wait to try it out! Only one issue.. I’m in middle of nowhere in the Scottish Highlands and really struggling to find pectine, can however fine jam sugar (added pectin), any idea how to replace the two? Hi! That’s a very good question. I did some reading on fine jam sugar, and while I think you could use it to make homemade jam without the added pectin, I’m not sure your jelly would set correctly. The jam sugar will help your jam to set, but not to the same consistency that store bought pectin would. You can make your own pectin from apples, but again I don’t think it would be enough pectin to make your jelly set. With jams it doesn’t matter as much because they will thicken more on their own, but jelly is a bit more tricky to get it to gel correctly. So to answer your question, no, I don’t think you could replace the pectin with the fine jam sugar for this recipe. Um, I can’t find the lemon juice in the instructions. Sorry about that! I’ve added it to the recipe directions.